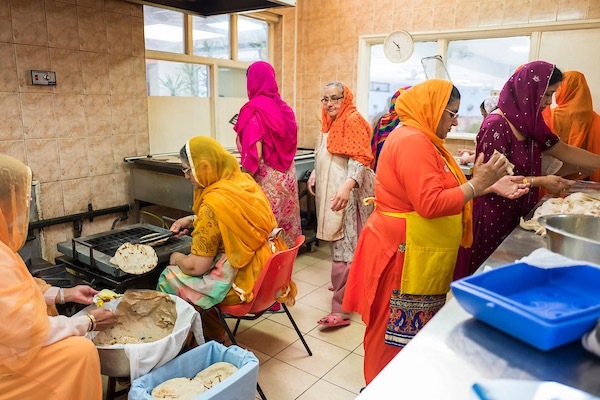 Photographer Andrew Baker has been documenting the life of the Gurdwara Dasmesh Darbar, Sikh Temple in Manor Park, for several years and I was delighted to accompany him recently to witness the annual ritual of Vaisakhi – a celebration of new year and harvest festival which centres around a flag pole being taken down, washed in milk and then re-erected with a new silk wrapping for another year. 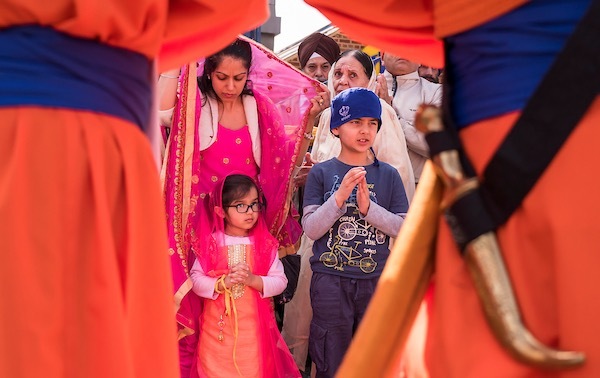 This ritual of renewal commemorates the events of 14th April 1699, after Guru Gobind Singh’s father had been beheaded for refusing to convert to Islam. 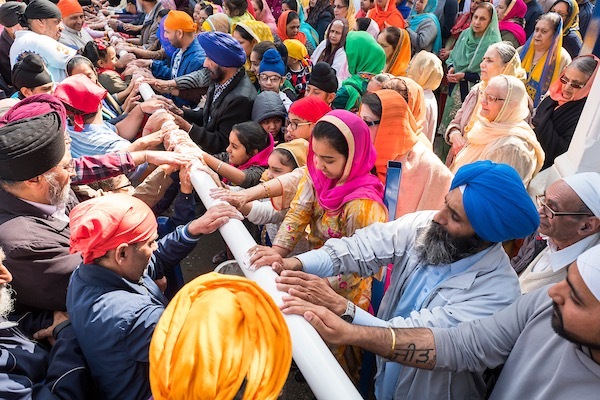 When the guru asked which of his followers would sacrifice their head as a proof of loyalty – five volunteers stepped forward into his tent one by one, and each time he emerged with blood on his sword. 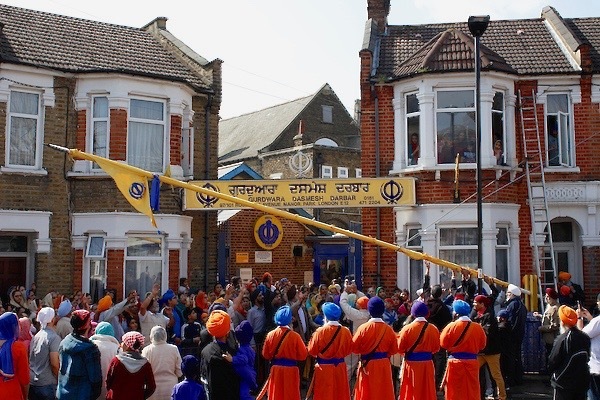 Yet on the fifth time, he emerged accompanied by the five volunteers all unharmed and they became known as the Panj Pyare (the five beloved ones). 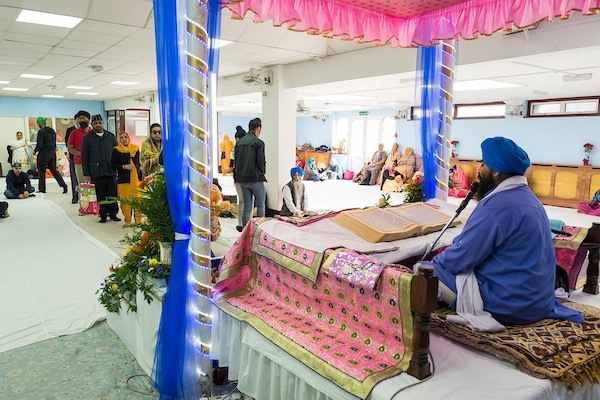 This was an initiation ritual establishing the Order of Khalsa, created by the guru to champion religious freedom and fight oppression of all kinds. 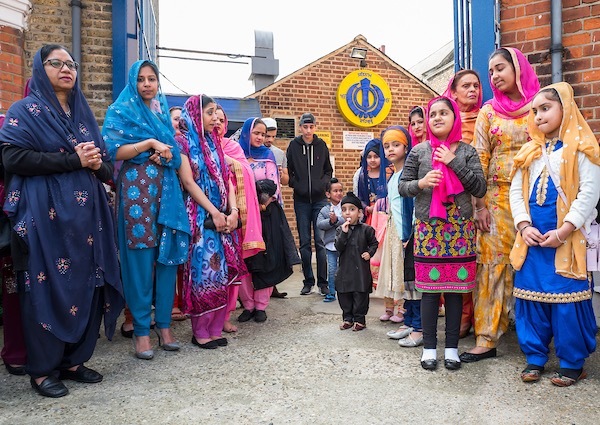 Meanwhile, more than three hundred years later in East London, I was astonished by the open-hearted generosity of the welcome I received – as a complete outsider to Sikhism – from both male and female members of the congregation when I visited their temple. 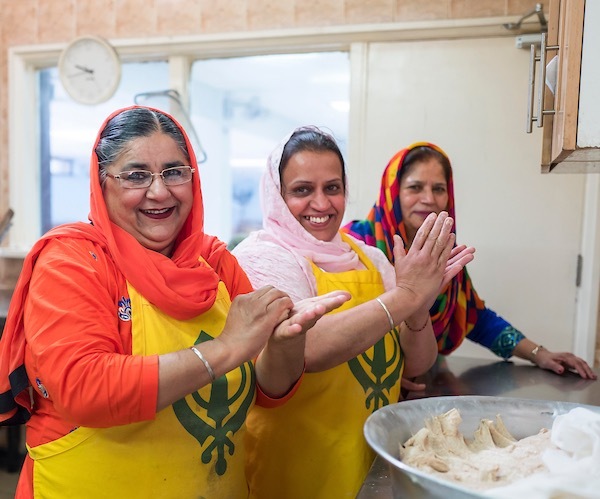 Upon arrival, I stepped into the kitchen where group of brightly dressed women were singing as they cooked huge pots of fresh green spinach and yellow chickpeas for the forthcoming Vaisakhi feast. 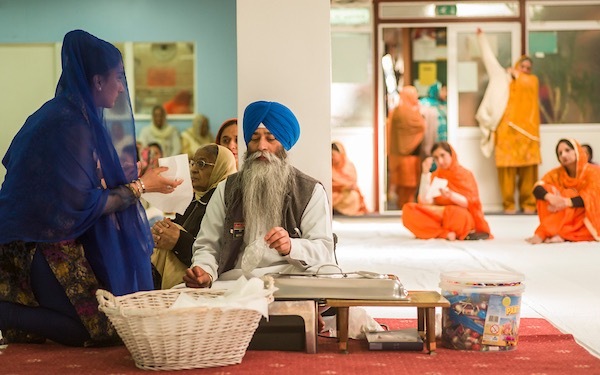 Removing my shoes, washing my hands and wrapping my head in a coloured cloth, I entered the temple and sat in a quiet corner while worshippers lined up to present their offerings during an extended reading from the Guru Granth Sahib, the Sikh holy book, by a distinguished gentleman in a long beard who could orate – seemingly – for hours without pausing for breath. Yet I noticed that the congregation were beginning to drift discreetly towards the exit, so I followed them outside to observe the activity. 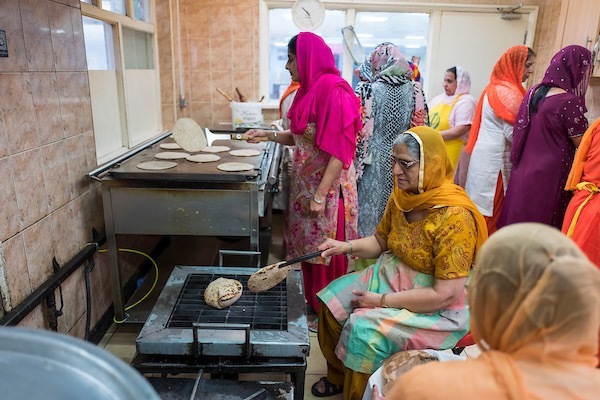 On my way, I put my head around the kitchen door again where the women were still singing but now working in a production line to produce enough roti to feed the hundreds that had assembled. 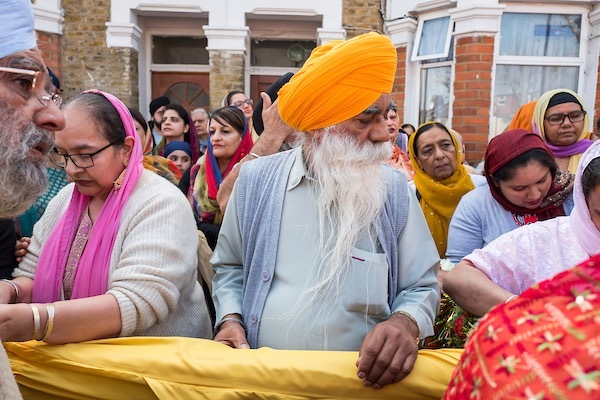 An excited crowd had gathered in the street, adorned in garments of blue, orange, yellow and pink that are beloved of the Sikhs. 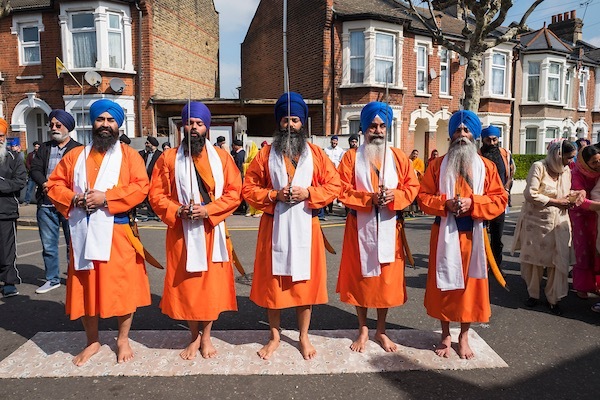 The sense of anticipation grew tangible as five bearded men dressed in orange tunics with white scarves and blue turbans, bearing steel sabres, processed out from the temple to stand barefoot in line upon five squares of carpet that had thoughtfully been placed upon the asphalt for them. These were the Panj Pyare. 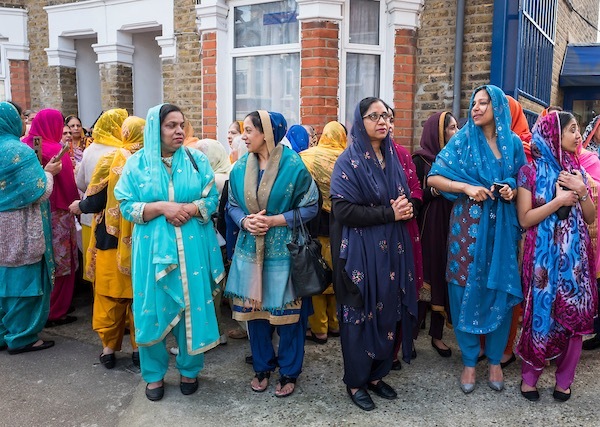 A group of women were chanting to a rhythm enhanced by an array of percussive instruments but all eyes were upon the flagpole with its steel finial in the shape of double-edged sword glinting in the sun. 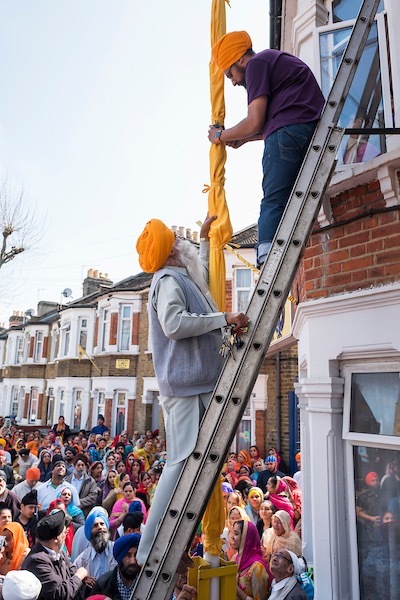 Two men on a ladder were dislodging the pole from the clamps that supported it and – with a cheer from the crowd – it hinged down to reach the forest of arms extended to support it as it reached horizontal. 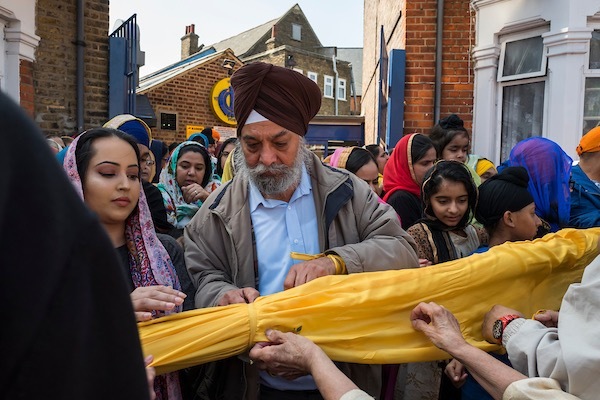 Once the ribbons that secured it were untied by members of the crowd, the yellow silk pole cover was pulled off, just like an extremely long sock. 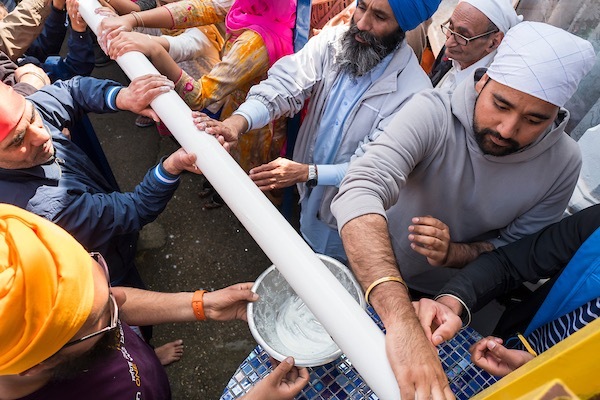 Then others with steel bowls of thick milk, almost like thin yoghurt, stepped forward so that everyone could dip their hands in it and apply the milk to the flag pole. On either side, people leaned forward eagerly to smear milk all over the pole with their fingers while standing back to prevent milk dripping onto their shoes. Then the pole was dried conscientiously with towels before the new silk cover was tied lovingly in place with ribbons. 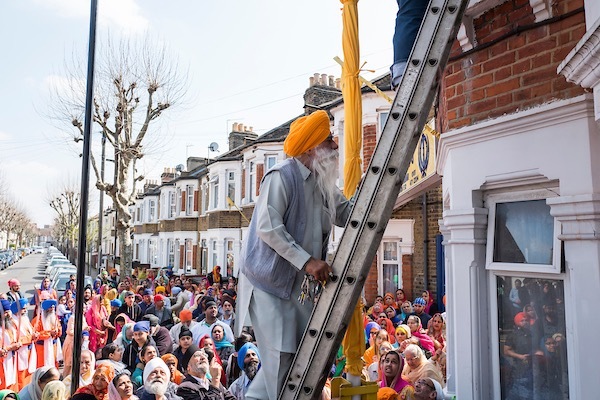 Once this was accomplished, the crowd was suffused with delight at their collective achievement to see the flagpole ascending to its vertical position again. 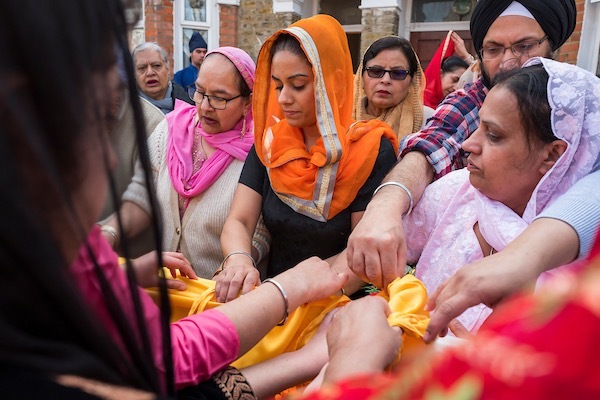 The five beloved ones led the way back into the temple with their sabres gleaming in the sunlight and everyone followed in hungry expectation of the feast that was to come. 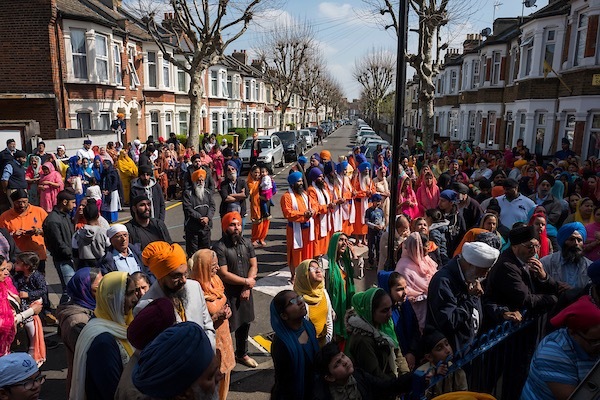 In this particular corner of East London, Vaisakhi had been observed for another year and spring was in the air. Thank you, Gentle Author, for another lovely and illuminating post. F A S C I N A T I N G …! 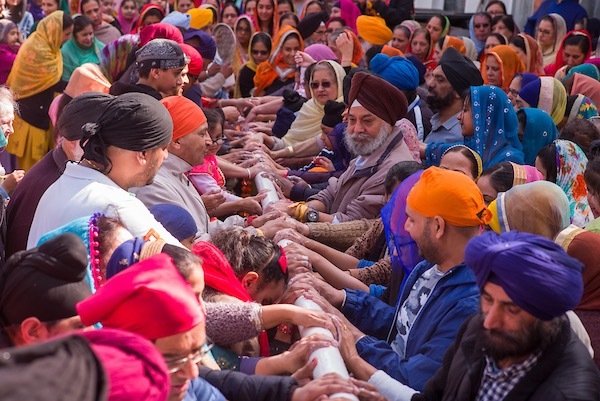 Thank you so much for enlightening us with the details of this tradition.